The major and minor scales may be music-education stalwarts, but they sound a bit academic when used over chord progressions. For rock guitar, you’ll want to learn to play the pentatonic scale, which supplies you with better melodic fodder. Although the pentatonic scale is not the only scale available for playing rock lead, it is the most widely used and easiest to learn. The beauty of this scale is that it sounds great over every chord change in a key, and you can begin to make music with it almost immediately. As its name implies, the pentatonic scale contains five notes, which is two notes shy of the normal seven-note major and minor scales, which creates a more open and less linear sound. The pentatonic scale is also more ambiguous, but this is a good thing, because it means that it’s harder to play “bad” notes — notes that, although they’re within the key, may not fit well against any given chord in the progression. The pentatonic scale uses just the most universal note choices. The pentatonic scale is to the rock guitarist what anesthesia, the printing press, and the cordless screwdriver are to modern civilization — an indispensable entity without which life would be much more difficult. The first scale you learn is the A minor pentatonic. A minor pentatonic can be used as a lead scale over chord progressions in A minor, C major, and A blues (“blues” can imply a specific, six-note scale, as well as a chord progression). It also works pretty well over A major and C blues. Not bad for a scale that’s two notes shy of a major scale. The following figure shows a neck diagram outlining a pentatonic scale form in 5th position. The neck is positioned as if you are facing an upright guitar that is laid on its side, to your left. So it looks like tablature in the sense that the first string is on top, but it’s a schematic of the actual neck instead of the tab staff. Try playing it, and just focus on making sure that you’re in the right position hitting the right notes. In the neck diagram, just like in a tab staff, the 1st string is the top line. Also, this is not a chord, but all the available notes for the pentatonic scale. 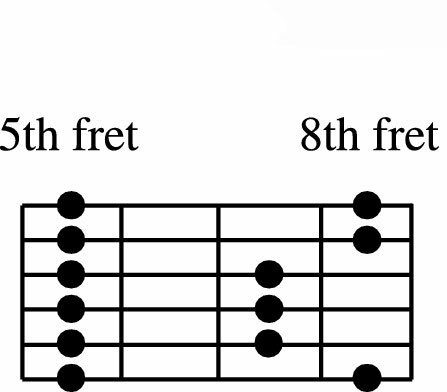 The left-hand index finger plays all the notes that occur at the fifth fret; the ring finger plays all the seventh-fret notes; and the little finger plays all the eighth-fret notes. In this particular scale pattern, the middle finger doesn’t play at all. Like a barre chord, you can move this configuration up and down the neck of the guitar to find different minor pentatonic scales. You just need to know that lowest note on the lowest string to figure out what key you’re in. For example, if you move this configuration up two frets to the 7th fret, the lowest note of the lowest string is B natural. Therefore, if you start playing this configuration, you’re playing the B minor pentatonic scale (which is also good for songs in D minor).